Every summer road crews are out across Saskatchewan working hard to build and maintain public infrastructure. These workers are often at risk from motorists who do not obey the rules of the road. The City of Saskatoon has launched a campaign to highlight the risks drivers pose to work crews throughout the city. The Respect Workzone campaign features interviews with three members of CUPE 859, who represent outside workers with the City of Saskatoon. CUPE 859 is proud to stand behind these members and the City’s campaign. “Every day CUPE 859 members work hard to provide valuable public services for the people of Saskatoon. 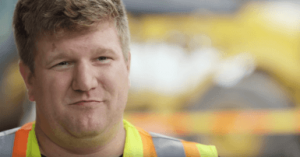 We are pleased to play a role in the Respect Workzone campaign as health and safety is an essential part of our everyday work,” said Mike Stefiuk, President of CUPE 859. Chronic understaffing and increasing workload are two of the most pressing issues in health care. CUPE 5430 member and Region 1 facility representative Sid Hall has seen the impact of both issues on patient care and health care workers first hand. Hall is a Continuing Care Aid at River Heights Lodge in Battleford, and a Battlefords Area Representative for the union. He represents both River Heights Lodge and the Battlefords District Care Centre. Hall consistently observed that staff had challenges meeting the many needs of residents in a timely manner. There just wasn’t enough time or enough people to provide the quality of care residents deserve. 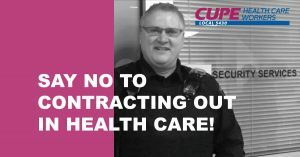 REGINA: CUPE Local 5430 is concerned that the province wide review of health care security services will open the doorway to privatization of security and other services. The Saskatchewan Health Authority (SHA) is conducting a province-wide review of security services, using an external consultant named Tony Weeks. Weeks conducted a similar review in Alberta in 2010 and recommended a centralized, mostly-privatized security service, which was implemented in that province. “We are extremely concerned that the goal of this review is to privatize health care security services,” said Sandra Seitz, president of CUPE Local 5430. 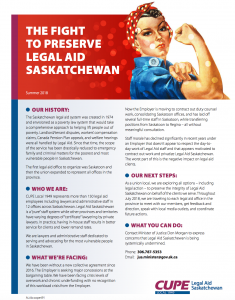 Legal Aid Saskatchewan provides legal services for the most vulnerable people in the province. The 150 CUPE members in CUPE Local 1949, representing legal aid lawyers and administrative staff, are fighting to preserve the organization from contracting out and threats of privatization. Learn more and contact the Minister of Justice to express concerns. Contact Minister of Justice Don Morgan to express concerns that Legal Aid Saskatchewan is being systemically undermined. 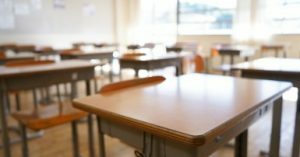 (Humboldt) The Horizon School Division is cutting days for ten-month term education support staff for the 2018-2019 school year. a 1.75% increase for 2019/2020. The Union also achieved parity with the GSTA (Good Spirit Teachers Association) LINC agreement for extra-curricular and noon hour supervision. Last week, CUPE Local 1949, representing approximately 155 Legal Aid lawyers and administrative support staff across Saskatchewan, was informed that the Saskatoon Duty Counsel work was going to be contracted out. Yesterday, the Union learned that as a result of three lawyer positions being contracted out to the private bar, two Legal Assistants and 1.5 Administrative Assistants would be laid off. In addition, the Union was informed that two Eligibility Officer positions were being eliminated in Saskatoon and redeployed to Regina. There was no meaningful consultation with the staff who do the Duty Counsel work prior to these decisions nor were there discussions with the private bar. CUPE Saskatchewan joins the Prince Albert Fire Department in commending the rapid actions of CUPE member and school bus driver Mark Jenkins, who ensured the safe evacuation of 16 students from their bus before it was engulfed in flames on June 15. Jenkins is a member of CUPE Local 4195 representing education support workers in the Saskatchewan Rivers Public School Division. “We salute Brother Jenkins on his dedication to ensuring the safety of these kids,” says CUPE Saskatchewan President Tom Graham. 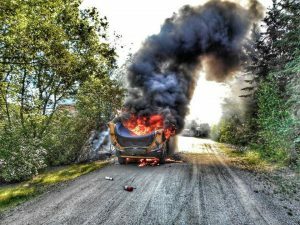 For more information on the incident, see the article published in the Saskatoon StarPhoenix and Regina Leader-Post. 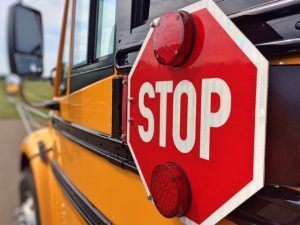 Ile-a la-Crosse School Division has decided to sell off its fleet of school buses and contract out bus services to a private bus operator. A study by the Saskatchewan School Trustees Association reviewed bus transportation costs in the province and found that contracted services were about 18% higher than the cost of board-owned buses. Recently, the Chinook School Division in southwest Saskatchewan announced it was purchasing 22 buses from Rilling Bus this June and taking over bus operation in the city of Swift Current. The local is also concerned about the six members who will be laid off.